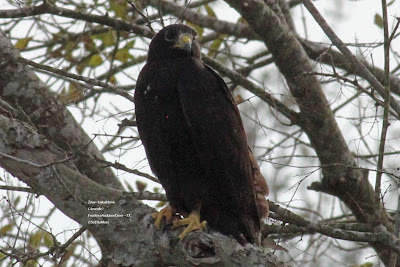 I hadn't been back to Frontera Audubon Center since it looked like the Zone-tailed Hawks would not be perching or roosting in same locations that could be shared with the many other birders who were interested in seeing them. I returned yesterday afternoon and was told that both the juvenile and adult Zone-tailed Hawks had been seen in the past week or so near the pond viewed from Audubon Frontera where I had photographed them previously. I found this juvenile Zone-tail perched in a tree on the other side of the pond from Frontera at 3:40 pm. Thanks to staff member on duty Chris Warren who was willing to stay past the 4 pm closing to accommodate viewing of the hawk by others who were there to look for it, a group of 9-10 birders (including several from England) were able to view, photograph and videotape this bird also.